New York (CNN) -- It was a security breach at one of the country's busiest airports conducted on a tiny scale. Eighteen workers at New York's JFK Airport were arrested on Wednesday and accused of stealing more than 100,000 mini-bottles of alcohol from LSG Sky Chefs, which provides food and beverages for American Airlines. The arrests capped off a nine-month investigation, dubbed "Operation Last Call" by the Port Authority's Office of Inspector General. Most of the accused were employed by LSG, but three were security guards hired by private contractors to guard JFK Airport and American Airlines. The guards are charged with taking bribes to look past the thefts and for receiving stolen property. "The defendants arrested in Operation Last Call violated and sold out their position of trust and access to the secure areas of the airport, including access to commercial aviation, all for personal greed," said Robert Van Etten, inspector general for the Port Authority of New York and New Jersey, which operates JFK Airport. Prosecutors allege that 15 employees of LSG pilfered bottles of alcohol left over from various American Airlines flights and sold them on the underground market to local liquor stores and bodegas. Taking place over many months, these thefts yielded an estimated retail value of $750,000. Law enforcement sources said the ring revolved around Domingo Duran, a retired LSG Sky Chefs employee. 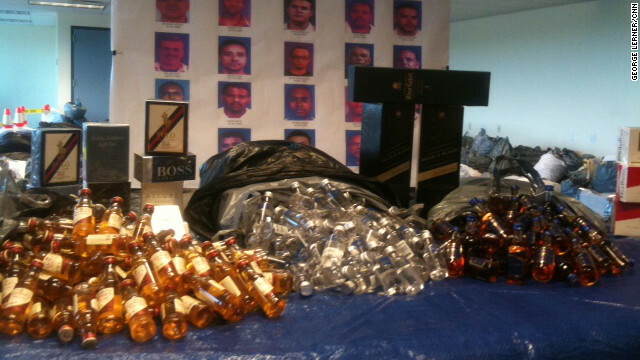 An early morning raid on Duran's home in Queens uncovered more than 50,000 mini-bottles of alcohol and $34,000 in cash. Duran faces 15 years in prison on charges of grand larceny and criminal possession of stolen property. CNN's attempts to reach Duran for comment were unsuccessful. Two of the three security guards worked for FJC Security Services, which has responsibilities for guarding the facilities at JFK Airport. The third security guard was employed by SCIS Air Security, which has a contract to guard airline property. An FJC spokesman said that the firm had been alerted to the alleged activity by an anonymous tip in November 2011, a half year after taking over the security contract at JFK. FJC immediately turned over the information to the Port Authority, which commenced a formal investigation. The case culminated when the LSG workers were summoned to an early morning meeting, where they were arrested in their uniforms. "They were engaged in the widespread theft and distribution of liquor and other duty free items," Van Etten said. "These arrests will serve notice that the Port Authority of will not tolerate criminal activity at its facilities." LSG Sky Chefs declined comment. The accused each face between seven and 15 years in prison. Waaaaaat no gin in picture. Nice article find that was an interesting read. 100,000 mini bottles are not worth $750,000.. 75,000 retail at most. Retail being what they would "retail" for on an aircraft, $6 or $7 each. The airline has a 700% markup. This has been going on for years. I remember seeing something on 60 Minutes some years ago about this. Hey! That looks JUST like my rollaboard on my last day as a flight at........um.......stealing is bad mmmkay? Im really surprised its worth that much. JFK jetskiier in the terminal and now THIS?! The sky is falling! Actually, from what I understand, the airlines dont pay for the minis. They liqour companies give them to them in exchange for brand loyalty and free advertising. Another Lufthansa heist at JFK! Don't let it go public, otherwise one of My Company's mainline partners might actually start tracking this stuff on MY airplane. We sold these at the liquor store I worked at in college. All the garbage liquor that is depicted in the article was $.35-.75 each. That was at retail not holy crap we're gouging you price. 750 grand one mini bottle at a time. I've seen the same $7 bottles Airways sells in a liquor store in Crystal City of all places for $1.25. So real world retail is probably half that or so. An early morning raid on Duran's home in Queens uncovered more than 50,000 mini-bottles of alcohol and $34,000 in cash. What are they going to charge him with? Being cooler than they are? And yeah, how typical of the Gestapo these days. VE HAVE SEIZED ZEEZ SWEI BOTTLEZ OF TYLENOL PM VORTH $300,000 ON ZE STREET!